In my effort to lighten my load, I decided to try out tarps. It took me a while to decide, after all we are so used nowadays to be inside that it seems very common to stay inside if it comes to shelters when backpacking. By the time I made the decision the temperatures were already under zero and the earth was covered in snow. 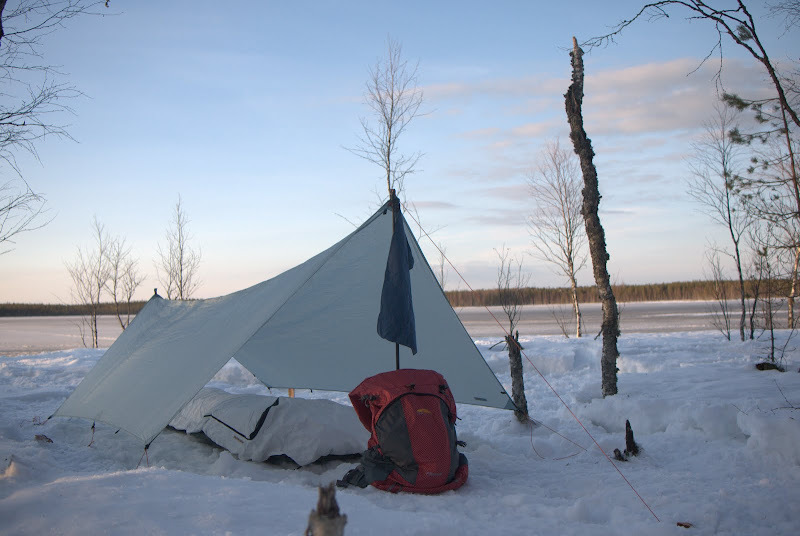 Not being shy or scared of a challenge, I decided to try them out just then in winter, because I might as well collect these experiences right then and there - after all, tarping in summer is relatively easy. Besides the aim of going lighter it was also the idea of being closer to nature and enjoying the views. 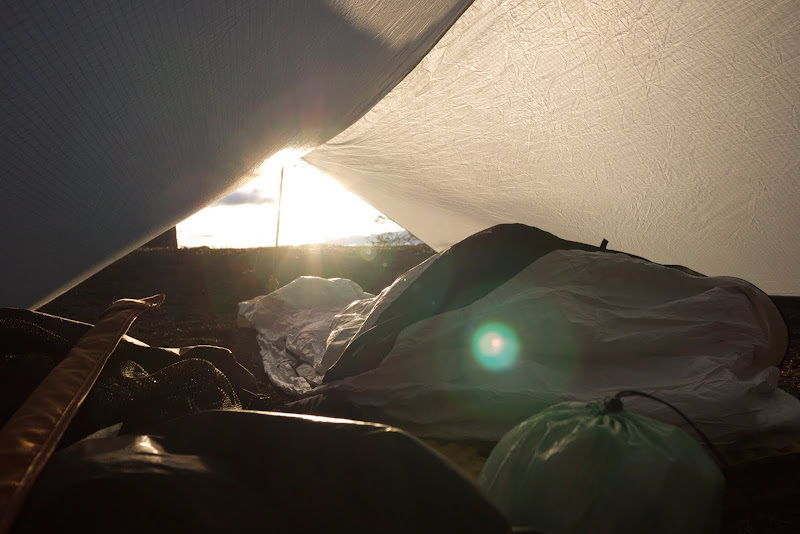 Being in a tent, even a tarptent, puts you in a confined space away from nature and your surroundings. 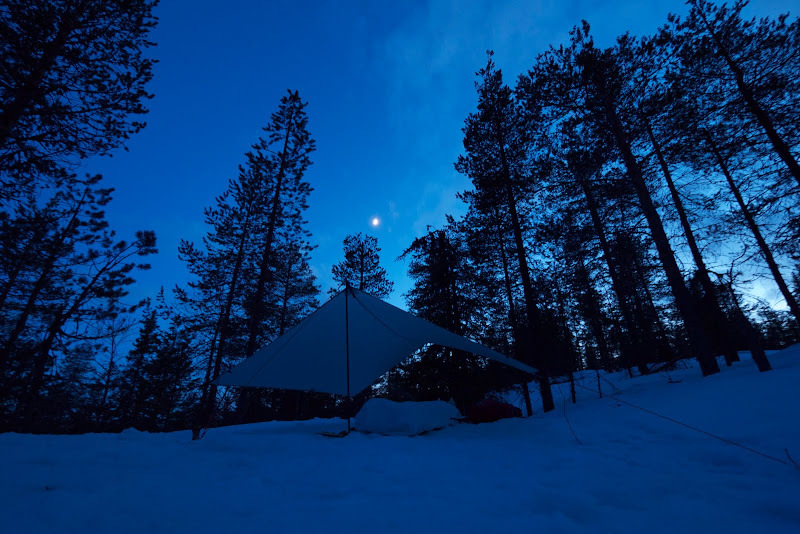 That can be a nice thing when the air is buzzing with insects or if a snowstorm is going down, but only very few folks will find themselves in the latter conditions outside and for the former there are also solutions when tarping available. It is thus fairly light, but to be honest one needs to add to the SpinnTwinn the pegs and the poles. Now, I am not a big user of trekking poles - I rather walk hands free - but for crossing streams and for pitching a tarp they are mighty useful. The poles I have for the SpinnTwinn are 80 g for front and rear pole, versus 200 g for a pair of Gossamer Gear LT4 trekking poles, the difference ain't too bad and the user of trekking poles will certainly use them. Add in your favourite set of pegs, which can be anywhere between 5 to 33 g for a peg, and you're looking at a trail weight of about 400 - 450 g for the SpinnTwinn, which is over two thirds less than the above two tents and half of the LightHeart Gear Solo tent. I had some time on my hands during my spring trip to the north and made this little video of how I set it up on snow, have a look. Watch it in HD - click the link and choose 720p from the drop down menu. Its fairly easy to set up with the two poles, with the trekking poles I find it less straight forward because you'd need to find the right height for them - I don't carry a tape measure with me outdoors, so it is by trial and error that I find the correct height. Other than that I can nowadays pitch it in about three to five minutes until it is nearly perfect. So how do I like tarping? Short answer: I love it. 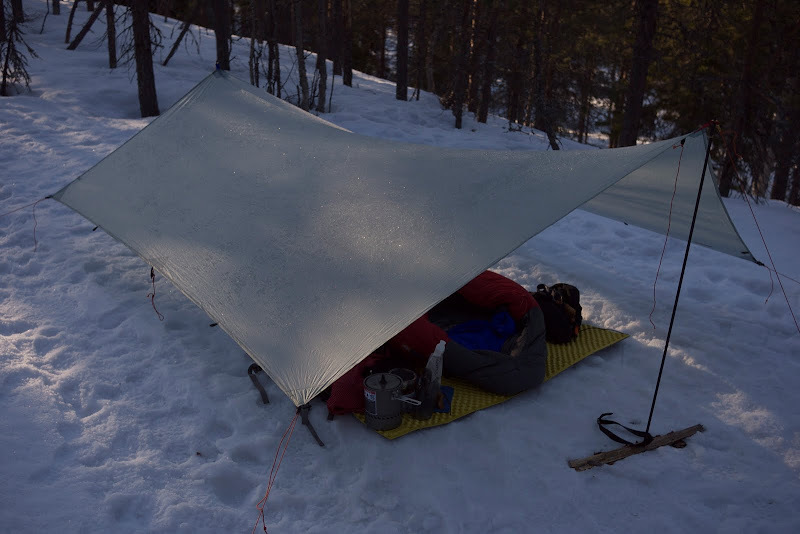 It is absolutely fabulous, I sleep far better than in a tent, I enjoy that I can right away see and hear everything that is happening around me, the fresh air, minimal condensation, lots of space - there is plenty to like about tarping. Sitting under the SpinnTwinn in my sleeping bag. The SpinnTwinn is a fantastic shelter. Fantastic, because at 175 dollars it is very affordable and allows the beginner as well as the pro to gain a great shelter made of Spinnaker. Spinnaker is lighter than Silnylon and does away with the sagging that is so common of silnylon shelters. I also find it very resistant against abuse, it is not easily pierced through, and there's also not any problems with water spraying through it. 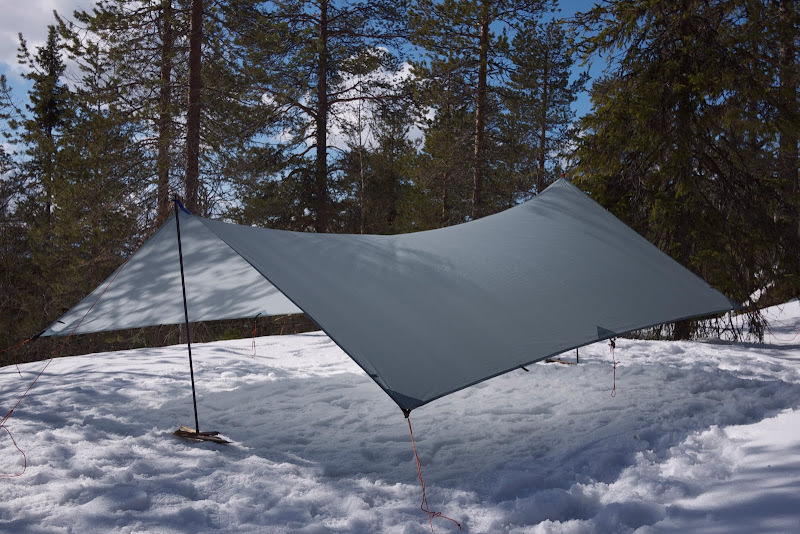 My subjective feeling is that it sits right between cuben and silnylon and combines the best of both: affordability of silnylon, lightness, zero sagging, no water spraying and the abrasion resistance of cuben. SpinnTwinn next to a MLD Cuben DuoMid and a MLD Silnylon Trailstar. Same shelters, different view. Phil checking out the SpinnTwinn. I know that some stay away from tarps because they life in areas with heaps of insects, especially the blood sucking kind. In those environments you're glad if you can stay in a shelter where you can keep your sanity and blood. 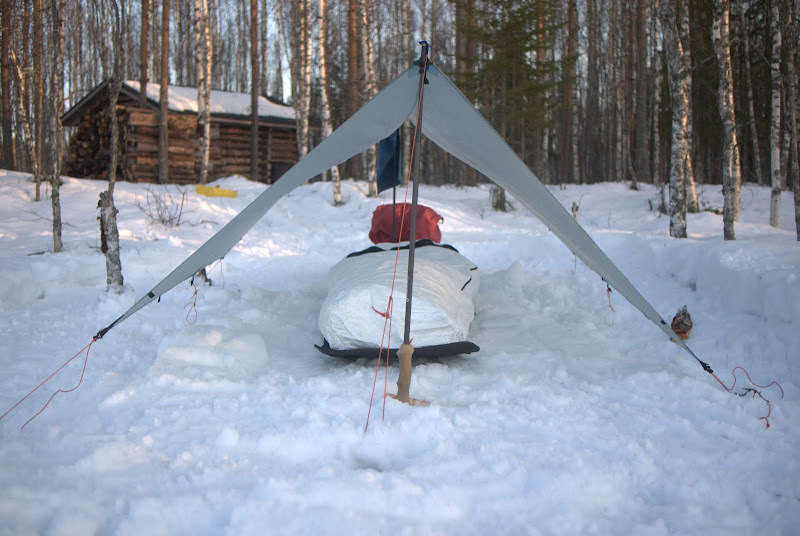 Going lightweight doesn't mean that you can not stay away from the insects and need to go mad. 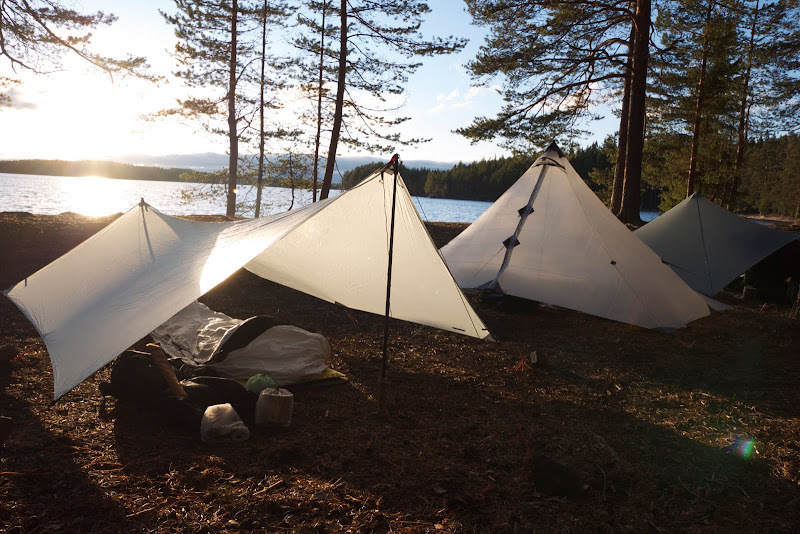 The solution is a bivy or a bug net, the latter being a simple tent made of mesh, giving you that insect free zone. Another argument against tarps is that they can't stand adverse weather conditions. 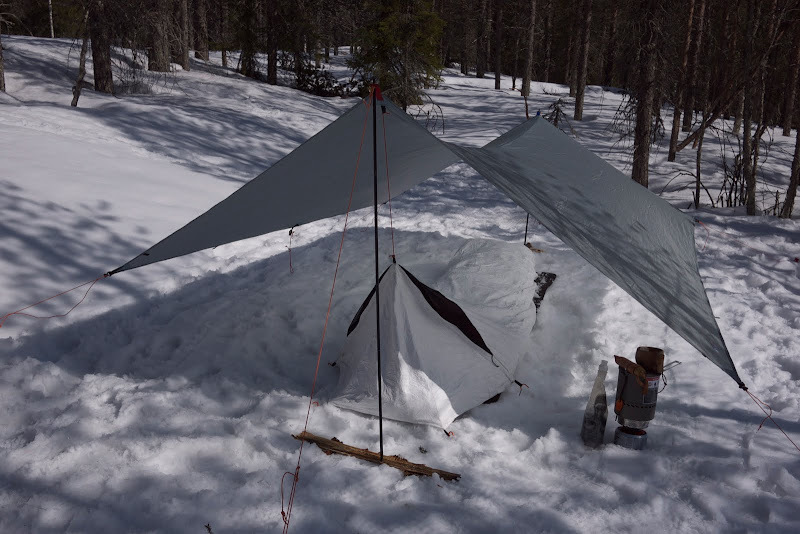 My tyvek bivy protects my sleeping bag from eventual snow or rain which might be blown under the tarp, or insects in the summer. Inside loops allow for the hanging of a line, or as in my case, an attachment point for my bivy. I get that. 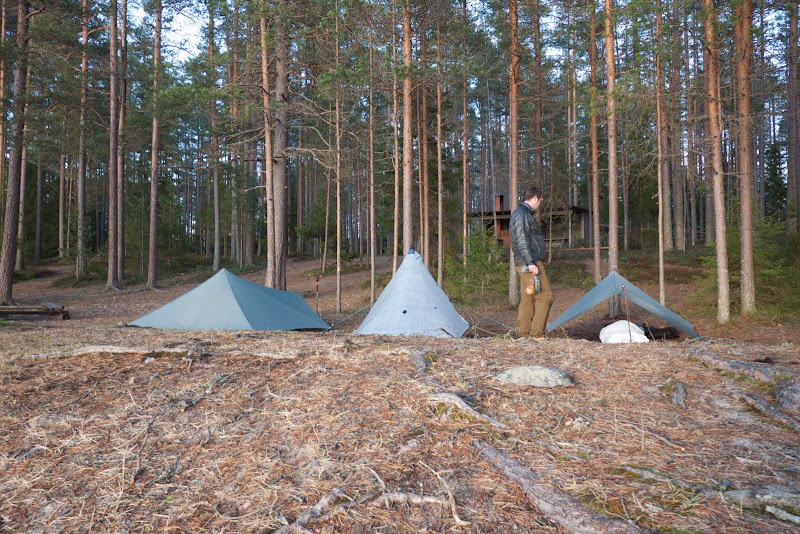 In Finland, and much of the Nordic countries, we have plenty of forests which are great for keeping the wind at bay and thus allow one to often find a sheltered camping spot. The scenery is different in the north, though, where treeless fjells will allow the wind and elements to run free and you won't find any protection besides your shelter. That is where the majority of folks will take their "bombproof" shelters, because the wind and rain/ snow could make life hard. Not having camped under those conditions yet, I nevertheless believe that the SpinnTwinn would be just fine and offer sufficient protection from the elements - if pitched correctly. 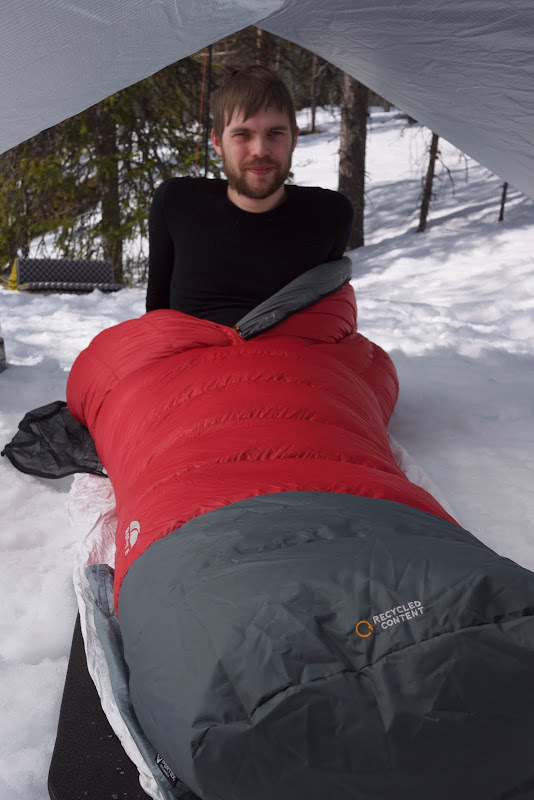 That would mean to pitch low and with one side into the wind, make sure your pegs are well dug in and don't come out, and you hopefully have a bivy to protect your down quilt from rain/ snow. There will be those who might disagree, and because of my lack of experience of tarping in the fjells I can only speak hypothetically. 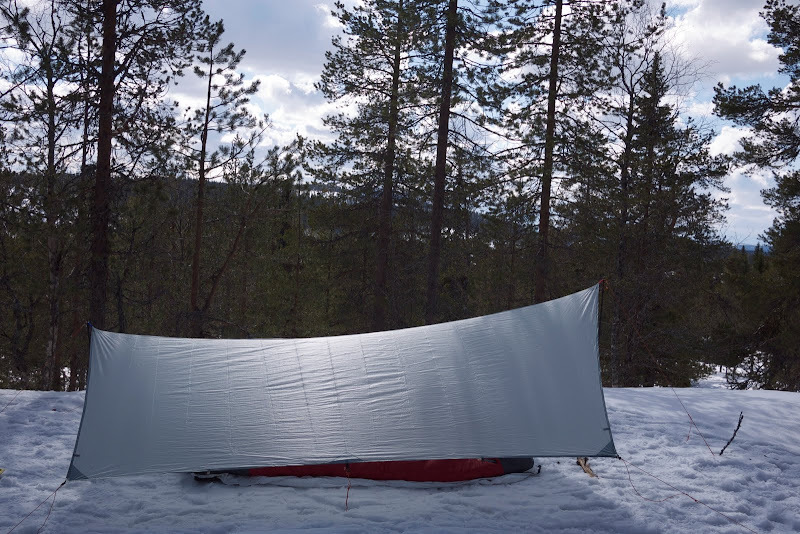 And I would trust the SpinnTwinn (or any other tarp) to protect me also in more adverse conditions when out on the fjell. I will keep this opinion until I have gathered sufficient experience to proof this right or wrong, but for me UL backpacking has as much to do with skills as it has to do with the gear. Back to the SpinnTwinn. 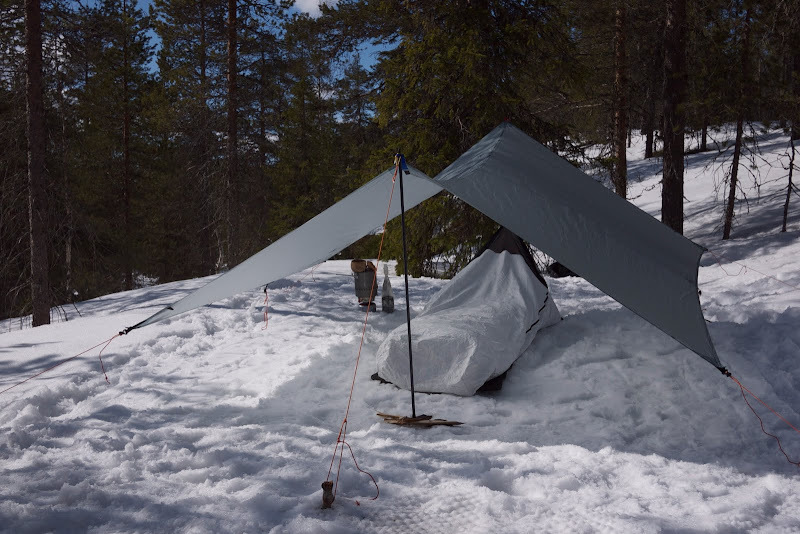 As you can see from the photos, I have used the tarp during winter and spring, on snow and on earth, in rain & snow and in sunshine, with strong winds going and without even a breeze. Once I learned to pitch it correctly - that took pitching it once or twice - it is easy and fast to set up. While it is a two person tarp I haven't yet tried it with someone else, but I am very confident that two could be very comfortable under it, even in the rain. As you can see above, it offers sufficient head room in the front (I'm 175 cm tall, no idea how tall I am when sitting) and changing clothes or packing your rucksack is no problem. I also like that it packs very small, and it fits perfectly in the front pocket of my LAUFBURSCHE huckePACK besides all the other stuff, where it can dry out when it is wet - that allows me to take it without stuff sack as well, saving a further 11 g!